The worst criticism you can level at any Bond movie is plainly that it is boring. Bond movies aren’t complicated. A super-villain, a world dominating evil plan, beautiful woman, cool gadgets, amazing stunts and exotic locations. What order you place them in and how creative you go with those is what determines how successful your Bond movie is. It should never be Bond either chasing or being chased around exotic locations for two hours. Bond films need substance and unfortunately, For Your Eyes Only has very little. It story doesn’t even really start that strongly. The opening sequence with the submarine and theft of the films macguffin, the ATAC system, is pretty by the numbers and is a standard Bond set-up. It then devolves into Bond going from clue to clue, being chased or attacked, foiling it and moving towards the next location. Occasionally there is a great stunt in-between or an action sequence that hurries the pace but these are noticable by their infrequency. Amongst the varied Bond ski-sections, For Your Eyes Only has one of the better ones. It begins as a standard downhill chase but ends in a strange but well-executed bobsleigh section which proves Bond still has some unique approaches, even to the more worn elements of the franchise. In fact, this stretches slightly further. One of my biggest complaints of the much-loved Thunderball was the poor underwater sequences and the dull fight that makes up much of the finale. In this, Bond is once again forced into an underwater battle but this time with one, armoured foe. It is much better than it’s Thunderball predecessor and makes for one of the more interesting parts of a very dull Bond film. Even if the story isn’t the most exciting, you can make up for that with great characters to feed the story through and around. These never really emerge though. There are two “main” Bond Girls. Carole Bouquet plays revenge seeking Melina Havelock. She gets one of the better Bond Girl introductions but doesn’t really offer much more than a convenient clue when Bond needs the next lead to his investigation. The less said about Lynn-Holly Johnson’s Bibi Dahl, the better. She is a creepy, obsessed (teenage?) girl who even Bond decides is too innocent/young to seduce. Her story becomes slowly more creepy and adds a very dark element to the main villain of the movie in the final act. It is the final act too as this is where he is finally revealed. It is no real surprise that Julian Glover is the movies’ main villain. Kristatos is actually a very interesting character and in the hands of Glover could have been decent enough but he is hardly given the chance. Aside from longer scenes in the final act, itself a quite dull end to a slog of a Bond movie, you can hardly call Glover’s contribution as villain that threatening or impactful at all. It says much more about the potential villain for the film. Blofeld does make an appearance of sorts but is used purely as a device to put to bed Spectre for good (or not, as 2015 will attest). His character makes a strange appearance in the pre-credit sequence and although it is clear what is trying to be done and why (lawsuits/character rights) it feels like it could have been done better. Considering he was the series main villain for some of the more iconic movies, it feels weak to give the character such a cheap and silly ending. Strangely, that is the silliest this film gets. It takes a more serious tone but as well as removing the silly, the fun seems to have been lost with it. 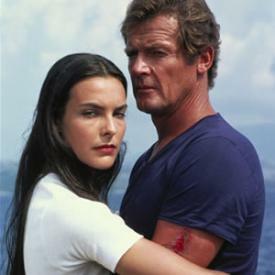 There is a lot to be said for a darker Bond but For Your Eyes Only doesn’t deliver this. As much as I like a more edgy Bond, Roger Moore is not the person for that and what is left is a dull, almost shell of the character. Overall, For Your Eyes Only feels like a by-the-numbers Bond film. It has exotic locations, decent action scenes and beautiful Bond Girls but lacks the creative spark that Bond films need. The villain is under-used and one of the more iconic bad guys discarded poorly. The silly has disappeared but strangely, so has Bond’s spark too. This is the first 007 film that felt geriatri-fied because of Moore’s age. Still, it’s got a catchy theme song. It does, that’s fair.Considering they don’t even bring attention to it, unlike Never Say Never Again which makes a point of highlighting Connery’s age. NSNA isn’t part of the official 007 canon. It’s an independent re-packaging of Thunderball. So, their take on Bond’s age technically doesn’t count. Odd that. I know but I think it made for a more “realistic” film. Actually recognising Bond as old was more interesting. I guess you couldn’t re-cast the character if you accept he is actually ageing though.